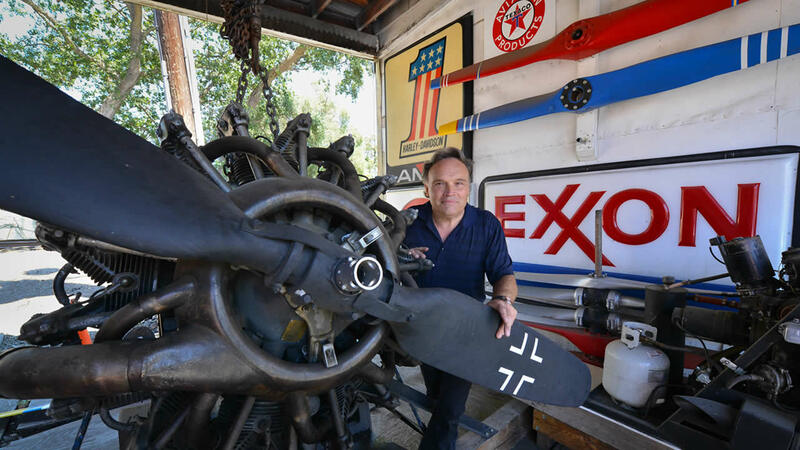 In the Napa Valley people are gathering to see a very unusual attraction, Mike Nieman's engine from a B-36 bomber. ST. HELENA (KGO) -- St. Helena in the Napa Valley is a quaint, trendy, good food, relaxing, quiet wine country escape. Then again, St. Helena has one obscure tourist attraction that would be none of those things... we'll get to that. Meantime, his name is Mike Nieman along with wife Jodie, the couple is best known for running a motorcycle rental shop right in the center of town. It's hard to miss the place, based on signage and what has become their word-of-mouth side business. "There are takers everywhere," says Mike. For a mere $100, Mike will fire up his pride and joy -- a Pratt and Whitney radial aircraft engine from a B-36 bomber. "The smell is unbelievable," says Mike. Fuel -- it smells like victory! Back in the Cold War, the B-36 was biggest plane ever built. It had 10 engines and was a strategic air command behemoth that could fly to Russia and back. They called it "The Peacemaker" because it carried 86,000 pounds of bombs. Mike does not limit is affection for airplane engines to just the one. He has a collection of them, all visible from the Napa Valley Wine Train as it rolls past his backyard every day. He rescued most of them from towers around the valley... likes working on them, too, piece by mysterious piece. When asked where he learned all of this stuff, he replied, "Google! Where else?" The passion goes back to his youth, growing up in the valley. Mike has fond memories of cold mornings and hearing the Napa Valley humming to the sound of those engines driving away the frost. It would appear that he never got enough. "It was the best sound you ever heard. Anyone who lives here can tell you it was like a fleet of aircraft, full throttle all the time. Wide open," says Mike. So maybe it's only natural that when Mike had an opportunity to buy the big one from a collector for $16,000, he just couldn't resist. At $100 bucks a pop, we asked his wife if it has become a moneymaker yet. Jodie replied, "Well, he hasn't paid for the engine if that's what you mean." In a small town like St. Helena, word spreads fast when Mike starts his checklist for an engine event. At the consignment store, next door, Christine Waldenburg has it down to a routine. She said, "All we do is bring the clothes in from the street, and we're fine." It's only natural to jump back instinctively when the Pratt and Whitney ignites. ABC7 News viewed it from a safer distance... on Waldenburg's roof. Those are 28 pistons, 56 sparkplugs, 4,300 horses burning four gallons per minute. It's a spectacle of deafening, pure power vibrating windows, rattling innards. In a small town where neighbors complain about leaf blowers, this is a complete anomaly. And maybe Mike is, too. When he fires his engine, visitors say they never get enough, down to the last sputtering gasp. Take a bow, Mike Neiman... you earned it.